The overdrive unit is the first stompbox offering from Abasi Guitars. Crafted by Abasi in conjunction with Brian Wampler of Wampler Pedals, the Pathos features “smooth” and “edge” voicings, a three-band EQ and volume and gain controls, top-mounted jacks for easy pedalboard placement and true-bypass switching. 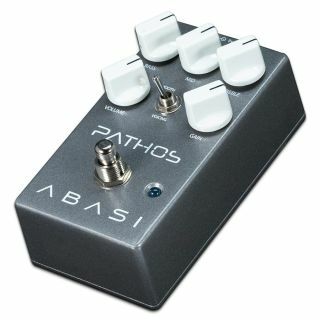 The Pathos is available for $199. For more information, head over to AbasiGuitars.com.